Bit of a long post coming up, but I am really proud of this build so far, even though the tank isn't even up yet. SO, the story starts about 9 months ago. I currently have a 20 gallon IM peninsula SPS tank. This tank was doing amazing. 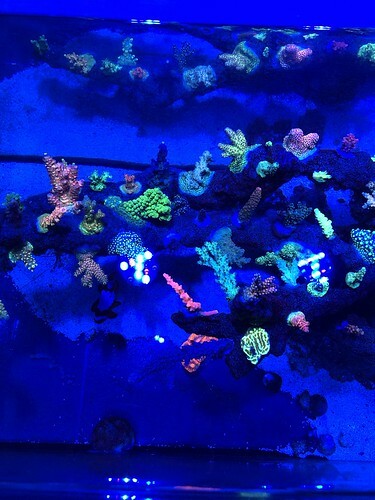 I had 70 frags of SPS piled into it and they were all doing very well. I had to install a calcium reactor because the consumption was so high my doser couldn't keep up. Everything was going great. Colors were great, growth was good, and the system was running itself other than weekly water changes. 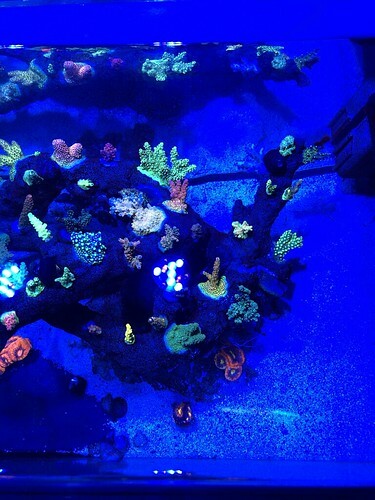 However, I had run out of space for corals. So, I started to plan an upgrade, cause once you run out of space, you upgrade. That's the logical progression, right? I really enjoyed the stand that I had gotten for the 20, and I wanted to keep it at all costs. Plus, I am planning on going to medical school in the Fall of 2020, so the tank couldn't be too big as I was planning on moving the tank. I decided that I would look around to have a tank custom made to the dimensions of the stand- 50"x 15-5/8"x 18" high. I figured having the tank cover the top completely would be very seamless and all around awesome. I also love the peninsula style, so I wanted to have it made like that as well. I got a few quotes from some custom makers, and they were all pretty high. I know you pay for the quality of the product, but, being 23, it was not financially in the books. After a few hours on youtube, I thought: "Hey, I could build this myself." 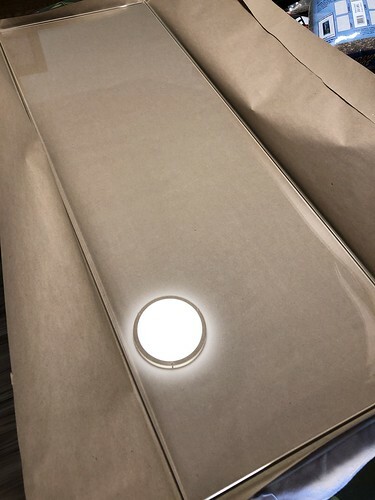 So i contacted a few fellow reefers who all agreed to help and I made the decision that I would build the tank myself. However, I noticed that some of the pieces in my 20 gallon were not looking good. But, it was localized to only a specific few pieces. I removed one of the pieces and dipped it in CoralRx. I was very disappointed to find AEFW come off. At this point, I forgot about the upgrade, and went into -save all my coral- mode. This meant removing every piece from the rock, cutting off the base, and dipping in bayer. So far they have been dipped in bayer 4 times. I believe the AEFW has eradicated. 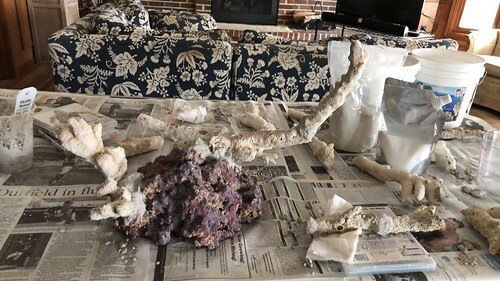 The colors of the coral are coming back (lost color from the dips) and when I blow them off with a turkey baster nothing comes off. 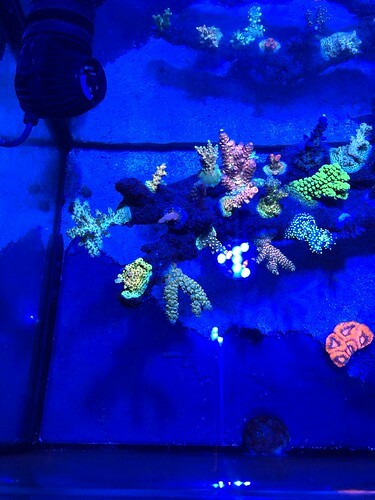 The corals affected the worst are starting to regain color as well. During this time, I have been slowly acquiring new equipment and getting things all set. The stand is split into two sections, and the two sections are small. I was planning on only doing a single sump in one section, then the other section would hold my Calcium Reactor. However, after making a cardboard cutout, things seemed tight with the skimmer and return pump that I wanted. 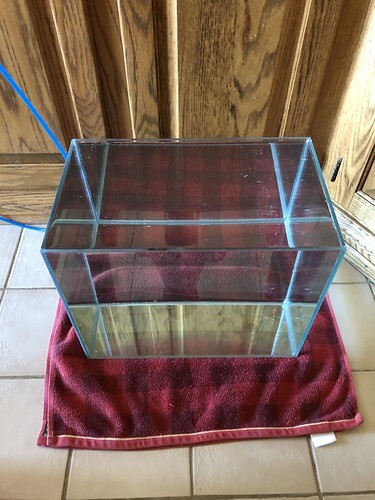 I decided that i would make two sumps for each section, drill a 2" hole through the center of the stand and connect the two with a PVC pipe. Double the sump, double the space. However, this also brought forth the question of "where will i put my calcium reactor?" The tank sits on a wall and the other side of the wall was clear of space. 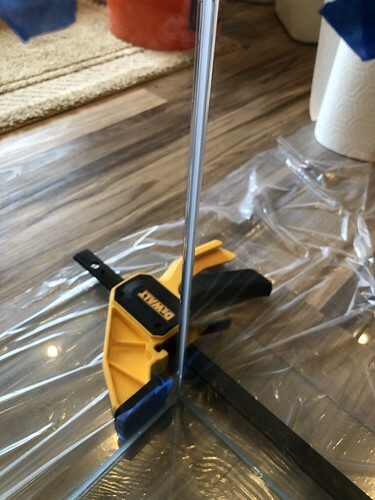 I asked my parents how they felt about drilling a few SMALL holes through the drywall so i could run the CaRX lines and the ATO line. Surprisingly, they both agreed, but my father said he is drilling the holes and overseeing it. 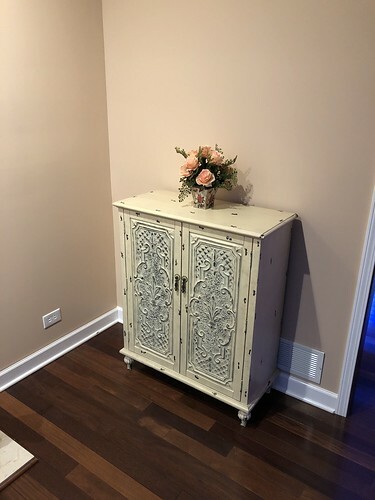 I bought a cabinet for the other side of the wall and my parents love it. 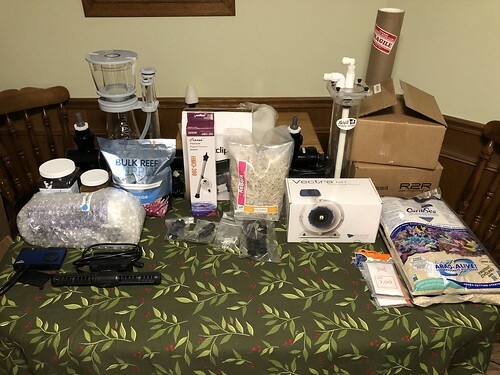 With another problem solved, I started to buy all the equipment I had dreamed of over a 6 month period. Again, I plan on going to medical school and bringing the tank. Medical school is very stressful and a lot of work, so I wanted to make the system as automated and nice as I could. I believe I accomplished this with the equipment I have. After this initial post, I will post again with a list of all the equipment. 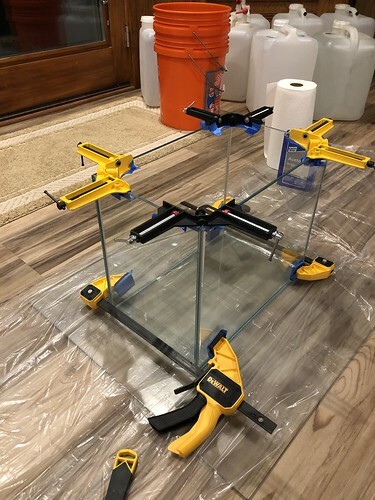 With most of the equipment bought, I tried to find a glass shop that was affordable. I inquired with 11 glass shops around the chicagoland area, and found one that quoted me pretty cheap. 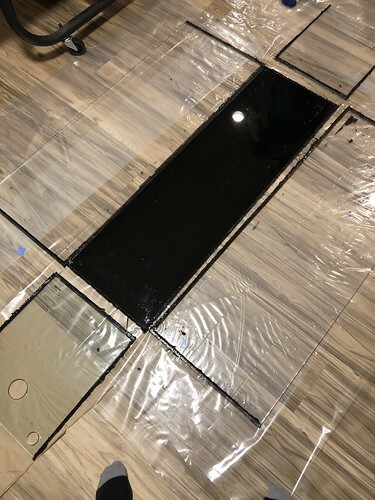 I went with 3/8" glass, 3 sides (peninsula) starphire, and I also bought the glass (1/4") for the sump. All of this came in about roughly 1/3 of what a custom tank only would have cost. Being so cheap, I was a bit worried, however HUGE shoutout to GlassWorks in Glenview as the glass is even more gorgeous than i could ever have expected. 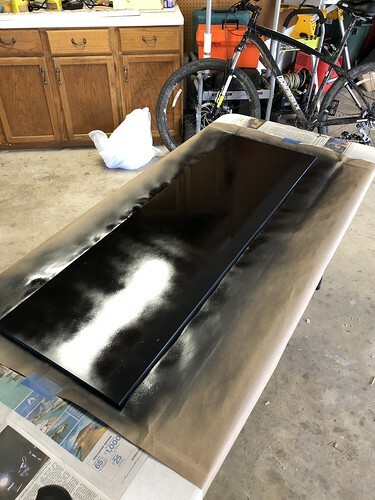 I then went to walmart, got a few cans of Krylon fusion and spray painted the bottom, which ended up looking 100000x better, and my perfectionist side was satisfied. With the bottom pane painted, I set up a day with my fellow reefers to build the tank and rocks. I was going to use an injection method with the silicone as it looked pretty easy. I was very wrong on that one. I had not taken into account the gap size for the silicone so two panes weren't sitting flush. This should've been my first warning to hold up. However, excitement was out of control so we continued. One reefer had built tanks before, but not with this method. I gave him the silicone gun and said lets do it. As you can see, it did not go well. We took it apart right away and scraped as much silicone off as we could. Then we all left and I went to bed, incredibly frustrated, but not deterred. 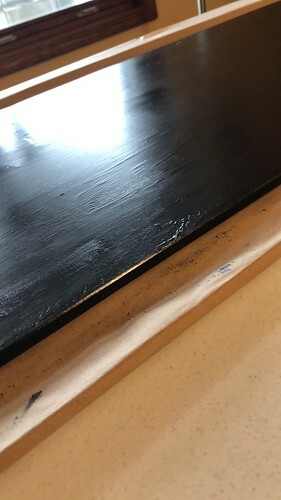 Over the passed month I've been removing the excess silicone and finally the panes are completely clean. However, (AGAIN HUGE SHOUTOUT TO GLASSWORKS) I had the glass shaved down and bought 1/16" spacers so the injection method would go smoothly. I also decided i needed practice building tanks. I started to practice and put together a set procedure. I built one sump and immediately figured out how I could do better, and the sump was disassembled. Then, I rebuilt the sump, but learned even more, but did not disassemble. The issue was the clamps at the top were very tight and caused the bottom to collapse in as there were no spacers in place. It pushed in slightly and didn't affect the integrity of the tank. 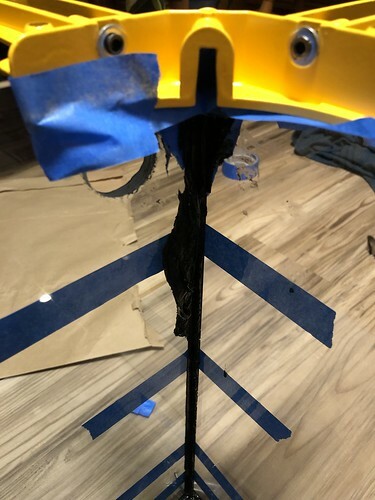 Furthermore, it took me too long to get the tape off and some of the silicone skinned over before i could pull the tape. I shaved off the excess silicone with a razor and leak tested it for 4 days. It held water all the way to the top (about 10 gallons), and I was immensely proud of myself. However, it did not look as good as I wanted to. i watched more videos and figured out that many company's use permanent spacers. 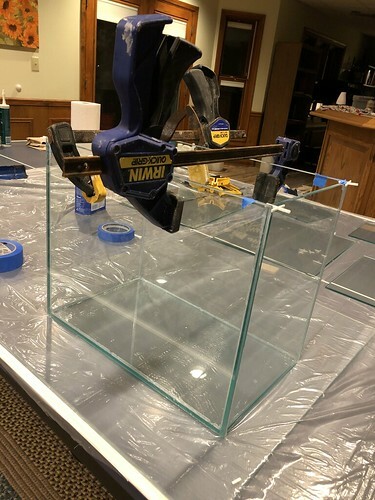 On the next trial, I cut out spacers, siliconed them onto one side glass on the top and bottom, set everything up and taped, i cut the tape at a diagonal on each end and created pull tabs to increase my speed. I built the tank, everything was going great (setup was tough as the silicone hadnt cured or dried so the spacers slipped out, but i got it set up eventually). I got to the seams going up the sides, removed 1 90 degree clamp and (for some reason) removed the second 90 degree clam. Obviously, the pane of glass slid out and the build was ruined. 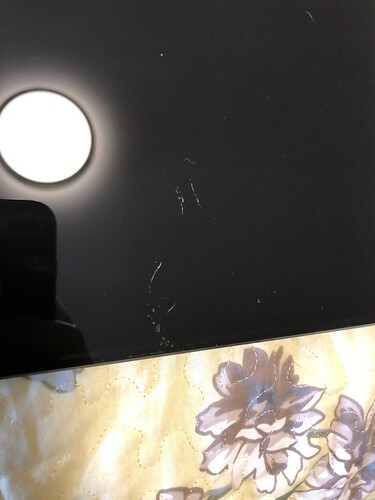 I also broke two panes of glass (oops) Trial 4- failure. However, I learned that I could only take one clamp off at time. Speed up to yesterday, I decided to go for trial 5. I had a procedure, and I was ready to go. 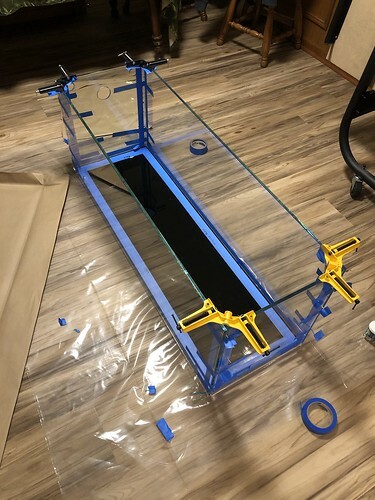 I superglued the spacers onto the glass, I taped the edges (with 1/8" excess measured with a protractor, seriously I'm a perfectionist), i put the clamps on and i had my silicon squeegee. I was ready. And i executed the build perfectly. The seams are beautiful, the glass is straight and perfect. I found a procedure that worked incredibly well and I was able to execute that procedure. I am very happy that I was able to accomplish this, and have a great amount of success. With this success, I have decided that it is time to build the main tank. 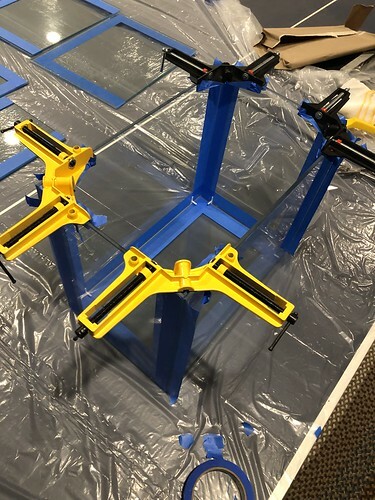 As the silicone will be black I am going to cut the spacers and spray paint them with krylon fusion (these will be incased completely in silicone so I am not worried about leaching. The silicone will adhere to the spacers as well). This build will happen next week at sometime, I will update the thread with pictures of success or another failure. Last edited by Kerber13; 04-04-2019 at 08:12 PM. As this tank is basically all custom, I also am custom building the rocks (sort of). 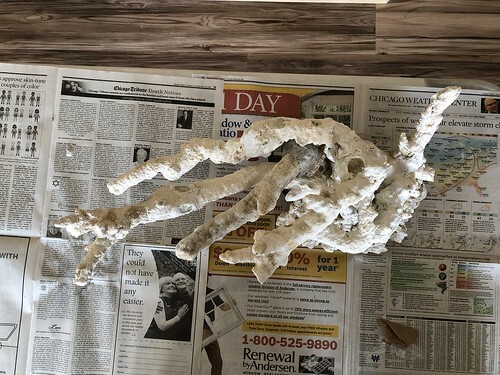 A fellow reefer and I are building the rock together as he is more experienced with the E Marco Mortar. 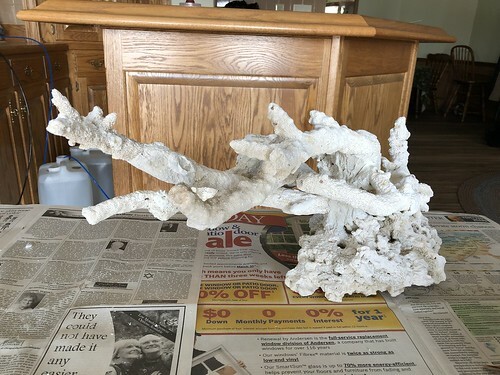 I am using the rock from the 20, however, we added another branch to make it appear more full, and the second rock structure, which will be another hanging reef type of rock is currently being made. I realize the second structure looks incredibly weird right now, but it is a WORK IN PROGRESS. It is nowhere near completion, and I will post pics when we put some work into it. So far, this is what I have done. I am very proud of how far this build has come. It has had its highs and very lows, but it has been so much fun. I quite enjoy building tanks, so much so, that I would definitely do it again. I really believe this build will be my best (I've been in saltwater for 8 years). I can't wait to update this thread and show you all how it progresses and evolves. Thank You Very Much for reading. I know this is a very long post. I appreciate you all taking the time to read it. If you have ANY questions let me know and I will get back to you. Equipment post and livestock post to follow. The rock will be positioned so the hanging portions face each other and create a large bridge or arch.